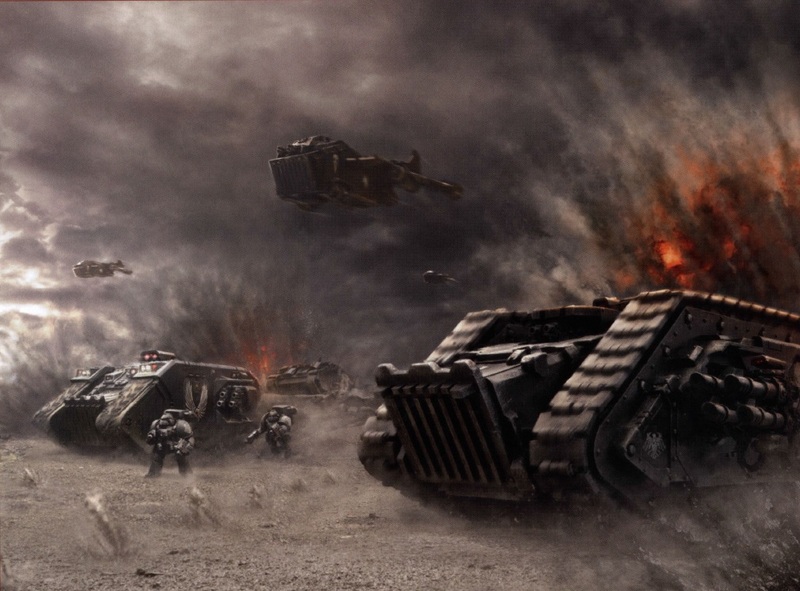 Pete Happens: Raven Guard 30K - An Unkindness of Ravens "The Air Force"
From a fluff perspective, Raven Guard had a full compliment of vehicles for their legion prior to the drop site massacre, but even after the Dropsite Massacre, Corax was left with a tattered Legion and had to reorganize them. They were combined into divisions based on combat specializations. The tactical companies became the Talons, the assault companies became the Falcons, and light vehicle squadrons and air support were renamed the Hawks. Another unit of genetically enhanced Astartes dubbed the Raptors was later added as well. The Hawks are a great opportunity to make a fluffy air force list. In any case, several readers requested some help building this type of list, and the truth is there is no set definition for a "Flier Force". First off I think of an "Air Force" and an "Air Cav" and a list with "Air Support" as three very different lists. An air force is about fielding fliers. An air cav is about flier transports. A list with air support is filling a niche with a flier (think Xerxes lightning for spartan hunting). Do you want ALL fliers or some? Are skimmers "flying" enough for you? Are you against guys on the board? Does deep strike feel like a flier force to you? Once you have an conceptual idea of what type of flier force you want, you will next need to familiarize yourself with the flier options. Here is a high level review of fliers and how they can fit into your force. Legion Fire Raptor Gunship (Heavy Support): The fire raptor has one of the best bang for the buck ratios in the game. It can target multiple units with great weapons and is a master at hunting light and medium vehicles. In a heavy flier list, I would seriously consider take 3 of these with reaper autobatteries. 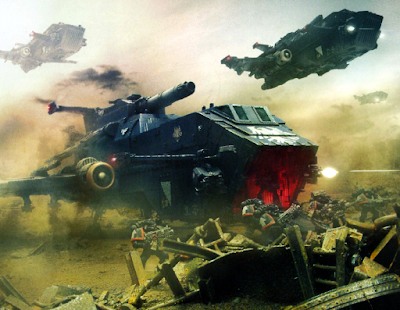 Legion Storm Eagle Assault Gunship (Fast Attack): Any legion can take a storm eagle as a fast attack choice. Personally, I like upgrading them with a multi melta and wing mounted lascannons. It's a nice gun boat. That said, from a point perspective, you are really spending too much for the fire power. You need to get something out of the transportation in order to make these worth the points and just about every infantry unit can already take rhinos, drop pods or just infiltrate for A LOT cheaper. 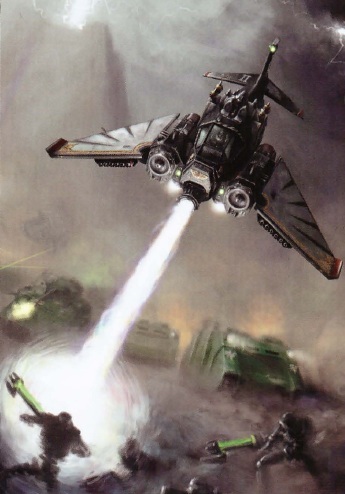 IMO, I think the only units that make sense to transport from an efficiency stand point are termi units with combi weapons, but certain elites can also be effective. That said, I've had success when paired with drop pods and other fliers. It's a tough unit to keep alive if you only have one flier. But a pair of them can be a serious thorn in your opponents side. Darkwing Pattern Storm Eagle Gunship (Fast Attack): Raven Guard can take Darkwings as a fast attack choice. These guys are cool units. Damn shame we can't upgrade the hvy boter to a multi melta, but outflank is a VERY strong ability when dealing with anti air units as you can often deploy outside of their LOS. Again, the only units that seem to make sense in these guys is a termi unit. And with that many eggs in one basket, the extra benefit of stealth might be worth it. Darkwing Pattern Storm Eagle Gunship (Dedicated Transport: Veterans, Terminators, Mor Deythan and Alvarex Maun can all take a Darkwing as a dedicated transport. So all these units are solid in a Darkwing. It might not be the most efficient way to deploy them, but it's a solid way to get guys where you want on a later turn. Legion Primaris- Lightning Strike Fighter (Fast Attack): Lightnings are great little glass canon gun platforms. There are a couple ways to run them cost effectively but most people go with the Xerxes build, which is all about Spartan hunting by loading up with kraken missiles. In an air force list, these guys are most likely your heavy tank hunters. Legion Xiphon Interceptor (Fast Attack): The Xiphon is a great anti air fighter. They are very effective at hunting other fliers, and with 2 twin linked cannons and a rotary missile launcher, they aren't bad at tank hunting in general. Legion Caestus Assault Ram (Heavy Support): Wins the prize for coolest fluff by far. On paper, these guys seem pretty expensive, but I have never lost this unit in the air. I also find the large melta blast very useful at obliting characters left out in the open after a termi unit double taps their combi plasma into a squad. Finally, the tank shock rules can be incredible if used correctly. You can basically tank shock a unit multiple times in one turn and run it off the board or go down your opponents line forcing tons of checks. It can also hold a ton of termies. Anvillus Pattern Dreadclaw Drop Pod (Fast Attack): Outside of running the Angel's Wrath ROW or the Recon ROW, this (and the Kbarybdis) is your only other way to bring in everyone in fliers. The anvilis is a great unit. For one, you don't have to get out of the pod when it comes in. You can even shoot out of it when it's in hover mode. Plus it can contest, unlike normal pods, and be reused.This is also the cheap way to deepstrike termies in a Raven Guard list. Kbarybdis Assault Claw (Heavy Support): The Legion sized drop pod. This guy is great at getting huge units across the board. Again, this isn't usually a big problem for Raven Guard, but it is an option. Legion Thunderhawk Gunship (Lord of War): The iconic Thunderhawk Gunship is a very expensive but very resilient and very hard hitting versatile unit. It can hold multiple unit with a limit up to 30 infantry or 3 dreads or a combo of the two. It also has access to one of the only destroyer weapons running around in 30K. It's a very flavorful choice for a flier list in larger games. Legion Thunderhawk Transporter (Lord of War): The Thunderhawk transport is one of those really fun units in a huge mega battle. It can hold transport tanks that can hold troops, which strangely usually means it can carry more guys than the Thunderhawk can hold by it's self. It should be mentioned that it's a super heavy so it can hold more than unit, which makes it interesting in that the different units can pop out and shoot and even charge multiple targets. On the surface, the Thunderhawk transport doesn't look that powerful, but it's only 400 points and is really difficult to take down. So you can totally play a list that touches down in later turns with unmolested units. Building an effective air force requires establishing air superiority and achieving mission objectives. This requires more than just taking fliers. Consider the following. Staying Alive: If at the end of any game turn, you don't have any units on the table you lose. Since fliers come in on turn 2, you need to get something on the board and it has to stay alive. Reserve manipulation: Playing a flier list is playing a timing list. Timing is everything. If you are losing board control, you need to get on the board quickly. If they have fliers you want to come in after their fliers. You generally want your tank hunter fliers on before your transports. Sometimes you want the fliers to stay off the board as long as possible to weaken your enemy. Deployment Accuracy: Fliers can choose to deepstrike. Having scatterless deepstrike allows for some interesting tactical options like rear shots on tanks and perfect deployment for flier transports. Dealing with anti Air Units: Anti Air units take many forms. 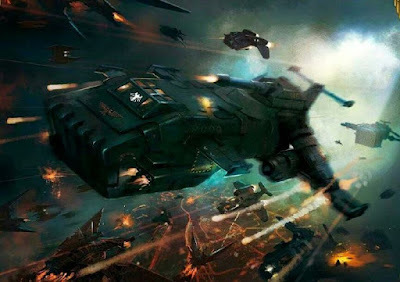 They include Doreado dreads, contemptors & dreads with heletical arrays, devastator squads with flak missiles, units near mysterious objectives with sky fire, sicarians, icarus lascannons from aegis defense lines, etc. Also beware of units with twin linking or large amounts of high powered strength. Dealing with other fliers: Reserve manipulation is a good way to get the drop on other fliers. Having more fliers is another way to win the flier war. Anti Air units can be a good way to protect your fliers. Something like a Doreado Dreadnought can go a long way toward owning the skies. Ground Control: Air force lists excel at kill point missions, but many mission are about holding objectives or controlling terrain or parts of the board. That said, with reserve manipulation and the ability to fly off the table into ongoing reserves, you can keep units relatively safe until the late game. But you do need units to push other units off objectives. MAY re roll to Seize the initiative. No scatter on deep strike within 18". MAY re roll FAILED reserves. Can add +1 or -1 to reserve rolls. Deep striking units don't scatter on a landing pad. Fliers can start on the landing pad but start in hover mode and can't zoom turn 1. Re roll to go first or seize the initiative. Shrouding for all models on the board that infiltrated or scouted. While it doesn't add anything to fliers it does open up Drop Pods, which are kinda thematic and are considerably cheaper than fliers for basic troops. It also opens up deep striking termies. Some lists are good just because they spam a certain element. Flier lists spam AV and hull points. Fast moving vehicles with decent AV is an interesting way to put scoring units on the board. Corax is an interesting unit in a flier list because he is similar to a flier in that he can also leave the board and redeploy. You can also force people to snap shot at Corax pretty easily with fliers all over the place. Finally, vets and termies are opened up as compulsory troops, which opens up dark wings. At first glance, this seems like an odd ROW for a flier force, but dreads are great at ground control AND can take quite a bit of anti air, helping you gain true air supremacy. It also moves you list away from infantry and transport fliers. Sky Hunter Phalanx is a fairly fluffy feeling ROW in that everything is "Flying". It also lets you have some fast moving skirmishers that can hold objectives and they can be tolled up to hit pretty hard in hth, especially against 2 wound termies. Let's get the obvious out of the way. Fire Raptors are an excellent value in your heavy support slot. I recommend upgrading to the autocannons. Lightnings and Xiphons are great anti tank options that you can take in your fast attack slot, and lightnings have spartan busting power with is pretty rare. You could go other ways with the lightnings, but this about as good as you get with tank hunting. So 1320 pts, this is a great core for an air force list. After this, your choices get harder. You can start with boots on the ground to trash things like deredeos. One thing to consider is Maun needs to start on the board to use many of his rules, so consider giving him cameoline and putting him in a resilient unit to weather the first shooting. Alternatively, you have lots of other scoring options like dreads, preds, jetbikes, etc. Normally, you see people post lists with infantry in storm eagles or dark wings. But storm eagles and dark wings quickly add up. 2 X Storm eagle w. vengeance launchers. The list definitely has issues with ground control, but it's very strong against a lot of armies in a lot of missions. That said, this list really magnifies the issue of most air cav lists. It's 900 points spent on 2 tac squads and 2 storm eagles. It's unlikely you will shoot an army dead enough to have a naked tac squad push its way onto a contested objective. 6 X 3 Jetbikes w. plasma cannons. You could also take a forgelord on a jetbike with rad grenades and find some points for some power axes for S6 obliting. In the end, you can see there are a lot of variations on the "air force" or "air cav" or "air support" theme of army. But the major thing you should take away, is that a Raven Guard flier list are strong, varied and interesting. They play very different than a standard Raven Guard force and Raven Guard have more options and do flier lists better than most legions. Dig the idea, I can't get past all the $$$$$ that it'd take for 3 fireraptors and 3 lightnings...LOL Kinda bananas, but those would be the three I'd take though. Seem like the best options to be honest. Maybe have 2 lightnings loaded for spartan/super heavy hunting and then 1 loaded with phosphex bombs to troll all the troops and terminators? Throw some autocannons on there and 2x2 phosphex bombs so you can hurt light armor with the autocannons and the lascannons on the lightning. Not to mention the plane would look SICK. Good show Pete, awesome article as always. But yeah. 3 Raptors seem an obvious choice or 1 if you go decap strike. The lightnings hit like a ton of bricks but the Xiphon is a solid option as well.